Savannah Smith’s been hurt by life. She doesn’t need people, then she meets Ethan Daly. In the peace of Riverboat Point, magic can happen. From the award-winning author of Right as Rain and Queen of the Road. Savannah has a chip on her shoulder. And no wonder: apart from her tough teenage years, a car accident not only claimed her parents’ lives, but left her with permanent injuries. She’s not close to her little brother Jax either – although she’s always been envious of his ability to just enjoy life. 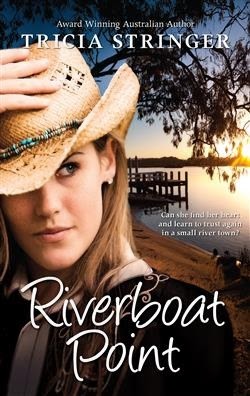 Jax moves to a small town, Riverboat Point, on the Murray River, and asks her to come too. She won’t leave the city but when Jax disappears leaving a vague warning to watch out for the neighbours, she’s forced to move and take over his houseboat business. Will Jax ever return, or has he met with foul play? Who is interfering with the houseboats and stealing from the business? Will Savannah find out the truth about Jax and Ethan’s deal ... and can she ever trust Ethan again? Tricia Stringer brings us some rural romance with a touch of mystery. Savannah arrives in Riverboat Point to manage her brother's houseboat business while he's out of town - and she doesn't know how long or where he has gone! People say that he's on "holiday" but she isn't so sure. He has always been the irresponsible one. He's left her a list of things to do, and instructions on how to operate the houseboats while he's gone, along with a cryptic message to beware of the neighbours. But which ones? All of them seem ... strange ... in their own way. Is Ethan the one she needs to watch? The handsome Afghanistan veteran is starting to get under her skin, and though he's helpful and gets her body humming she isn't so sure she should trust him fully. Or maybe its Gnasher? The old Vietnam veteran is a little strange, skulking around on his land setting booby traps and well ... he doesn't quite seem to be all there. Then there are the duo that come in from the city every weekend, the woman is ... well ... a bit over the top, especially when it comes to men - and isn't she married? The man seems rather serious and straight laced - how on earth do they find anything in common? Savannah is confused - she wants to make friends with her neighbours and the locals, but who can she trust? This book is the perfect mix of romance and mystery, it sucked me in from the very first - when the strange man and his dog knock on the window of Savannah's car after she had fallen asleep on the side of the road. A fantastic read with well developed primary and secondary characters, I recommend this book to anyone who enjoys contemporary romance. I purchased this book for my own collection and was not required to give a review.